The duo put pen to paper in a brief signing ceremony conducted in the spectacular surrounds of The Edge Steakhouse at The Ritz-Carlton in Rancho Mirage, with stunning views below of the Coachella Valley's desert landscape and in the distance the rugged Santa Rosa Mountains. 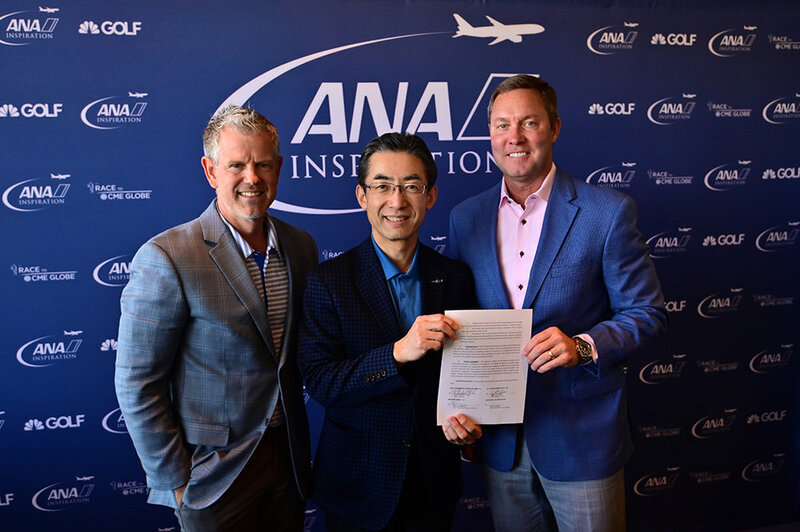 All Nippon Airways, Japan’s largest 5-star airline, has been title sponsor of the $3 million ANA Inspiration for the past four years and Tuesday's signing, which took place just two days before the opening round of the tournament's 2019 edition in Rancho Mirage, confirmed ANA's desire to commit until at least 2022. "I've been Commissioner of the LPGA for 10 years and if I'm honest the best day of my Commissioner experience was the day that we got ANA to join us here in the desert, not just because we were getting a title sponsor, not just because of what this means to the LPGA, but because your people have such big visions," Commissioner Whan said as he looked at Hirako, seated to his right. "ANA doesn't do anything small and we don't consider this small. This is as big as the LPGA gets. "So my second best day in the LPGA will be today when we sign the agreement for 47 more years," Whan added with a huge grin, sparking roars of laughter around the room. "That's my April Fools' (Day joke). On behalf of all of us in the LPGA, not just the players who are playing, not just the women that played before but probably most importantly for the millions of little girls all around the world that are going to be watching this and dreaming of what ANA has built and of jumping into Poppies Pond, that's what this really means. It means a lot of young women all around the world have a dream for decades to come and that is the most important thing. And thanks to the huge ANA family, that dream is alive and well all around the world. Thank you." Since 1988, the winner of the first women's major of the year has traditionally celebrated her victory by jumping into the pond which surrounds the front and right side of the 18th green on the Dinah Shore Tournament Course at Mission Hills Country Club. That pond is popularly known as ‘Champions Lake’, or ‘Poppie's Pond’. In response to Commissioner Whan's comments, Hirako replied: "All Nippon Airways, ANA, is very honored and very excited to extend the contract of sponsorship of the ANA Inspiration until at least 2022 - and hopefully for a longer period, hopefully forever!" More laughter erupted across the room. "As Mike says, we are very happy with our family here at Rancho Mirage and also we are very excited to see younger golfers getting more opportunities today and playing well. I would like to see them play all over the world in the future. Thank you very much for today." As title sponsor of the ANA Inspiration, ANA has helped promote junior golf worldwide. Having inherited a junior tournament for elite Southern Californian golfers, the ANA Junior Inspiration has spread wings and established itself with the best junior golfers from around the world competing for a coveted spot in golf’s first major of the season. Last year, junior golfers from 14 different countries took part in the ANA Junior Inspiration, just one example of how ANA has helped women's golf on its inspirational journey. Cindy Kou of Windermere, Florida, earned the final amateur exemption into this year's ANA Inspiration by winning the ANA Junior Inspiration on Sunday in a three-hole playoff with Joyce Jin of (China) Encinitas, California.